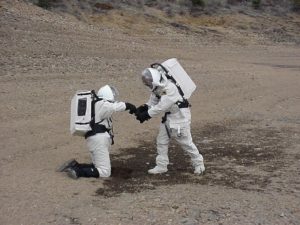 The local chapter of the Mars Society performed a simulated mission in Nederland, Colorado during the weekend of Friday, April 27 to Sunday, April 29. The mission was intended to help prepare for field mission and mission support activities taking place during the FMARS mission on Devon Island during the summer of 2001. 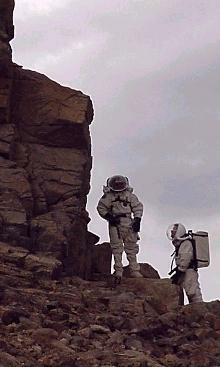 Mission objectives included testing of the analog space suit and testing of mission support protocol. The space suit was designed and built by Patty Piteu with input and assistance from volunteers in the local RMMS chapter. 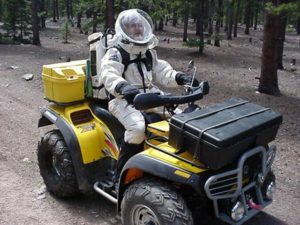 The helmet and backpack were designed and built by local chapter member Dewey Anderson with input and assistance from other volunteers. 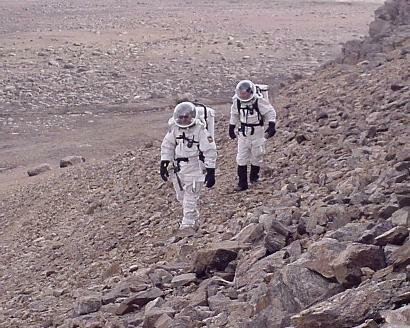 Devon Island field team members will be wearing the space suits at all times when they are not located in the Mars Habitat. During the practice mission it was found that some modifications needed to be made to the suit design. The suit proportions have been changed for improved mobility, pocket sizes were increased for easier usability and several design modifications have been made to improve the backpack. Each day, after the field mission was completed, the field team reported back to mission support with summaries of the days activities and reports on potential space suit improvements as well as problems encountered during the day. Mission support activities went smoothly with the exception of some minor miscommunication problems. The importance of taking care to communicate ideas clearly and politely was realized, especially because a 20-minute communication delay was implemented to simulate a real Mars mission. The 20-minute delay will also be implemented during the Devon Island mission. Mission support will be located at Pioneer Astronautics in Lakewood, Colorado this summer. Please contact us if you are interested in participating in mission support activities. Mission support will provide engineering, scientific, and general support as needed so that FMARS simulated missions run as smoothly as possible. Communication will be maintained via e-mail and also sometimes by use of sound files.